Above is an image of the Winter 1984 Inside Out front page story and photo on the appointment of Jacqueline McMickens as DOC Commissioner. Below is the text from the issue's article about Jacqueline McMickens becoming DOC Commissioner. The article began on the front page and jumped to Page 10. 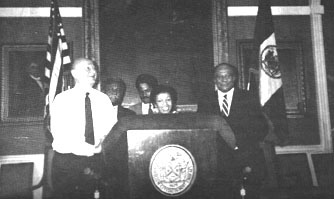 It was accompanied by a front page photo of the January 1984 appointment announcement in the City Hall Blue Room; its caption text and a digital image of the photo scanned from the front page also appear below. The issue's centerfold (Pages 8 & 9) included a photo spread on the swear-in ceremoney held later in the City Hall Board of Estimate chamber; its caption text and a digital image of the photo spread scanned from the centerfold also appear below. Jacqueline M. McMickens is the new Commissioner of Correction, the first member of the Department to move through the ranks from correction officer to commissioner. Commissioner McMickens, who has served as Chief of Operations since October, 1979, was selected January 18 by Mayor Edward I. Koch to succeed Benjamin Ward, the City's new Police Commissioner, following a 10-week search for Commissioner Ward's successor. "Jackie McMickens has all the attributes needed to run the Correction Department -- she's smart, wise and, believe me, she's tough," Mayor Koch told a packed news conference in the Blue Room at City Hall. "She will be presiding over the department during one of its most trying times. With more resources being put into the criminal justice system, more persons are being arrested. In the next four years we will add almost 4,000 beds to the system which will result in a doubling of the capacity of the agency and of its staff in the decade between 1978 and 1988. "She has to be able to deliver acceptable services to the prison population and speak for the correction officers. Above all, she has demonstrated that she knows the importance of discipline and security in our correction system. Ben Ward set a high standard and Jackie McMickens is a noteworthy successor." For details about arranging a research appointment, visit the NYCHS Archival Services page. If you have a copy of a newsletter issue that we do not list and if you want to arrange making a copy available to us, visit the NYCHS Artifact Recovery page. In her own remarks, the new commissioner thanked the mayor and the former commissioner and saluted the department's rank and file. "From a personal standpoint this is obviously the proudest day of my life," Commissioner McMickens said. "From a professional standpoint, the fact that I am the first Commissioner of Correction who is also a product of our department is an indication of the level our department has reached in recent years. I owe a lot to Ben Ward. But it should be noted that Ben was only one of a number of mentors within the department and city to whom I owe a great deal. "I only hope that we can live up to the standards that Commissioner Ward has set for us and that I can live up to the confidence Mayor Koch has placed in me. Perhaps best of all, this appointment will afford me the opportunity to continue working with the fine men and women of the Department of Correction, who do this city proud every day of the year." Commissioner McMickens joined the department in 1964 and spent most of the next decade as a correction officer assigned to the old Women's House of Detention in Greenwich Village. During those years she and her husband William, a bacteriologist with the City Health Department, raised three sons. Commissioner McMickens also found time to return to college, earned a bachelor's degree from John Jay College in 1972 and a master's in public administration there four years later. McMICKENS NAMED .... Commissioner Jacqueline McMickens is surrounded by notables, l to r: Mayor Edward I. Koch, William McMickens, the Commissioner's husband; Maurice McMickens, one of the Commissioner's three sons, and Police Commissioner Benjamin Ward as she smilingly accepts the appointment of Commissioner for the NYC Department of Correction. The Commissioner's appointment marks the first time a correction officer excelled through the ranks to position of Commissioner. By then, she had begun to rise through the ranks -- and make some history. Between 1973 and 1978, Commissioner McMickens was promoted to captain, assistant deputy warden and deputy warden. She was the first woman selected to head the Training Academy, the first woman assigned as chief security officer of an all-male facility when she became deputy warden for security at the Adolescent Center on Rikers Island, and the first woman to command the Kings County Hospital Prison Ward. expansion of in-service and promotional training for uniformed and civilian employees. RED-LETTER DAY ... When Mayor Edward I. Koch (left) delivered the oath of office to Commissioner Jacqueline McMickens in the Board of Estimate chamber at City Hall, Commissioner McMickens asked her predecessor, Police Commissioner Benjamin Ward (right) to preside. The new commissioner commanded center stage at the moving and impressive ceremony, delivering an address that brought prolonged applause from hundreds and friends, associates and admirers who jammed the room and later toasted the Commissioner McMickens with champagne in the Blue Room downstairs. In interviews following her appointment, the new Commissioner indicated that she hoped to continue and expand upon many of these improvements as the department adds space and staff to in the implementation of the expansion program approved late last year by the Board of Estimate. She said that two areas of specific concern will be renewed emphasis on training officers in their early years in the department and a re-examination of the agency's level of compliance with Federal consent decrees. "This job cannot be learned in a classroom," Commissioner McMickens said. "Our officers serve an apprenticeship, in effect, and with the tremendous expansion we are in the midst of as well as normal rates of turnover, a very large percentage of our staff is relatively new. We have to do as much as we can to help these officers educate themselves." Commissioner McMickens noted that the department continue to work closely with the Office of Compliance Consultants -- a city-funded team established to mediate questions over compliance with consent decrees -- an in effort to bring the department into total compliance or to seek changes in those decrees that the department considers ill-advised or unworkable. "My mission is pretty much to make this place a good place to work and to cary out its mission as cost-effictively and creatively as possible," the new Commissioner told the New York Times in a "Woman in the News" interview the day of her appointment. "People ought to work in an environment as livable as possible."